Awarded an MBE for services to forestry in 2017, Graham is personally responsible for over 10,000 acres of forested land in England and has overseen the growth of Pryor and Rickett in recent years, as well as making major contributions to the growth of Woodland Heritage over the same period. ‘Graham arrived at a really important time in the development of Woodland Heritage and helped guide the charity to a new level of working. The trustees are most grateful to Graham for his unwavering support over the last eight years and are delighted that he will remain involved in Woodland Heritage’s work as a leader on our Woodland to Worksop course and in helping to plan our annual Field Weekend; it was most apt that he should finish his time as a trustee at this year’s event’. 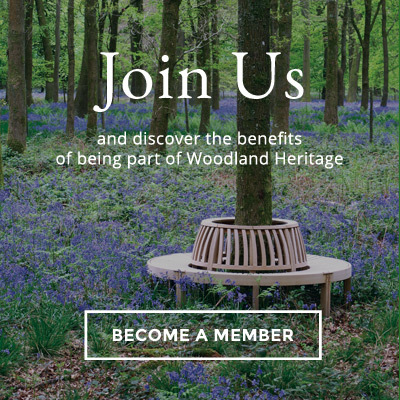 Graham signed off his trusteeship at Woodland Heritage’s AGM at the Long Barn on the Norbury Park Estate, Staffordshire. Home to a most adventurous experiment in mixed planting of over one hundred species of trees as well as centuries’ old woodland, the estate also boasts a new sawmill and plays host to the remarkable BIFoR FACE project. All the elements of the estate, including Ranton Diamond Wood and its adjacent arboretum, were visited on a packed day for members of Woodland Heritage. Also visited on the Field Weekend in Shropshire and Staffordshire were the seed unit and seed orchards run by Forestart, the premier supplier of quality tree, shrub and wildflower seeds, based in the UK, as well as the Capability Brown designed landscapes of Weston Park with its nearby Lizard Wood, rounding off the diversity of locations visited over the three-day event.